A wide varying blend of Cuban seed tobacco produces a special, unique aroma for this Medium to Full bodied cigar. Punch cigars arguably is one of the most recognizable cigar brands in the world, and rightly so. Featuring a Connecticut binder, a dark wrapper and a blend of the finest Dominican, Honduran and Nicaraguan filler available, it is no wonder why Punch has received numerous 'excellent' ratings by all of the top cigar review websites and magazines. 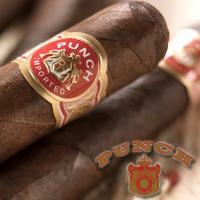 Grab a box of Punch Deluxe, Punch Grand Cru, Punch Champion, Punch Elite or view our entire selection of Punch cigars. The choice is yours.